A personal annecdote…in June 1999 I fell into conversation with a group of visiting South African students in Leeds. 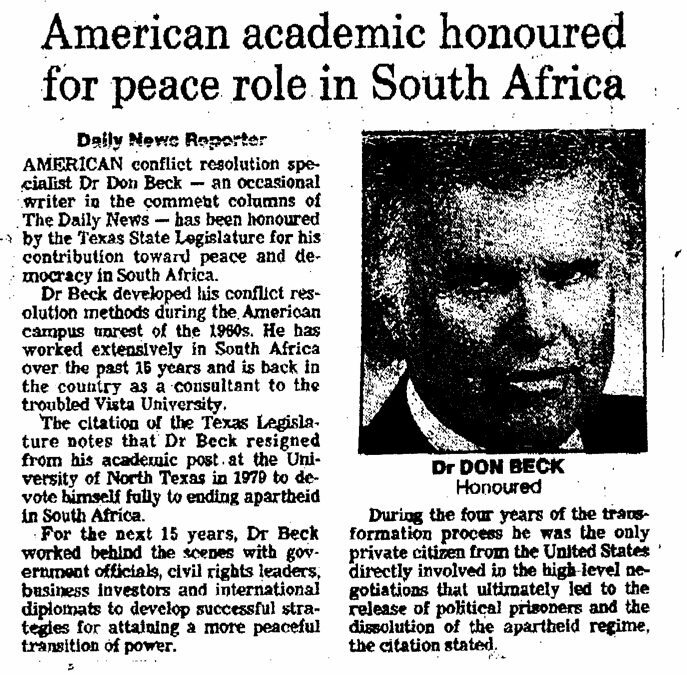 To my surprise, they not only knew of Don Beck but regarded him as something of a ‘political hero’. (2 of them had actually seen him speak at a university appearance.) One of them told me that, thanks to Beck’s work, race would be a dead issue in South Africa inside 5 years – and these students were from the Transvaal, hard Boer Afrikaner stock from an inherently-racist tradition! Race-as-a-dead-issue has proved hopelessly optimistic but the students’ comments give a flavour of just how much impact Beck and Clare W Graves’ ideas had in South Africa in the 1990s. Beck’s own account of his early work in South Africa is given in ‘The Crucible: Forging South Africa’s Future’, co-written with Graham Linscott in 1991. The book was dedicated to Clare W Graves as he had died in the Winter of 1986 before he could witness the first large scale application of his seminal work. The complete Senate version of the resolution can be accessed here (courtesy of Don Beck). Following the publication of ‘The Crucible’, Linscott published his own book ‘Uhuru & Renaissance: South Africa in a New Century’ in October, 2001. In it he uses Spiral Dynamics to look at how values have influenced African and world history in the 20th Century. It also considers how using a different approach can be beneficial to help understand the African continent as a whole. 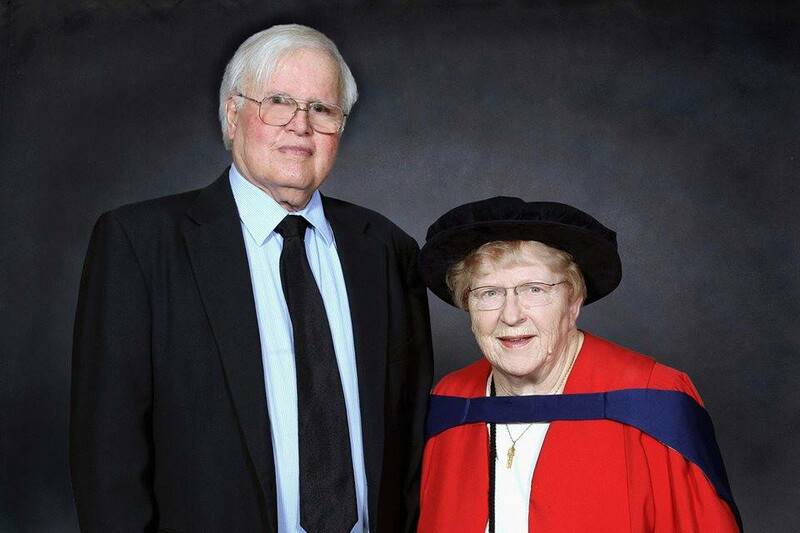 Don Beck himself returned to South Africa in late 2013, as he told Volckmann: “I had a call from Stollenbosch University School of Business Executive Development, close to Cape Town, asking if I would come out and restart the process. Of course, I accepted. They said that the title of the work would need to be South Africans reinvent themselves for the 21st Century. What we are doing is taking leaders back to 1994, the day after Mandela was inaugurated in Union Building. The question was then posed: ‘Knowing what you know now, 20 years later, what would you have done differently then?’ That stirred up the most interesting insights, because now they have the advantage of 20 years of experience. The Stollenbosch promotional material stated: “Beck’s spiral dynamics approach was the basis for the creation of the Peace Committees and the subsequent CODESA process in the run up to the first post-apartheid elections in 1994“. Of the great statesman himself, he said: “…the contribution of Mandela was that he had an open system. He was pretty communist so I can tell you he went to conferences in Switzerland and heard the nature of the Fifth Level business system. He came back a changed man. Consequently, South Africa has as its advantage far less racism than in our own country, thanks to Mandela…. I kept warning during the transformation days – it’s not going to be a civil war. Rather, South Africa has a chance of being that much more, both white and black, thanks to Mandela once again. Thanks to Rica Viljoen, Loraine Laubscher, Russ Volckmann and Elza Maalouf for permission to quote extensively from their work. Thank you Clive E Rice for your accurate blog about Dr Don Beck’s work in South Africa. It is a lovely, authentic and soulful representation.